"I started working on this matter five days ago by first communicating with the Foreign Minister of Jordan," said Foreign Minister Retno Marsudi. JAKARTA: Indonesia on Monday urged the Organisation of Islamic Cooperation to convene a special meeting immediately to discuss the restrictions imposed by Israel on the faithful visiting the Al Aqsa Mosque in Jerusalem. 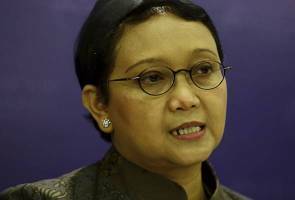 Foreign Minister Retno Marsudi was quoted as saying by online media that Indonesia had contacted OIC secretary-general Dr Yousef Ahmad Al-Othaimeen to express Indonesia's concern about the ongoing developments in Palestine and urge the OIC to convene a special meeting immediately. The online media also reported that Retno had contacted her counterparts in several OIC member countries on the matter. "I started working on this matter five days ago by first communicating with the Foreign Minister of Jordan," she said. Last Friday, Israel imposed a ban on Muslims below the age of 50 from attending prayers at the mosque and installed metal detectors at the third holiest site in Islam after the holy cities of Makkah and Madinah. The restrictions angered the people of Palestine and several of them were killed in Israeli soldiers' attacks on demonstrating Palestinians.